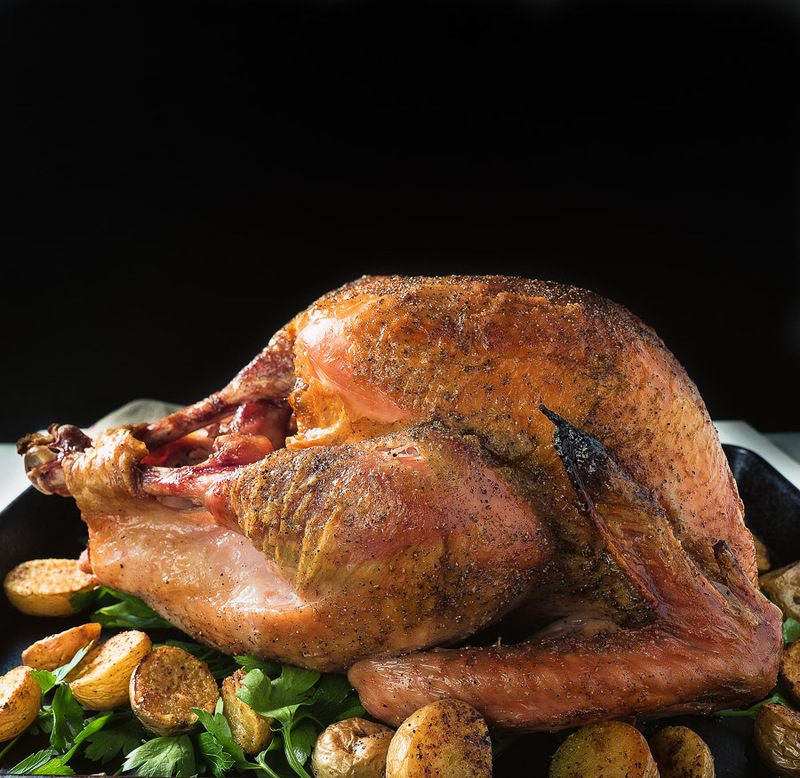 Grill roasted turkey is a great way to make a smaller turkey into something completely different from your traditional Thanksgiving bird. Something magic happens. The gentle smoke from a charcoal grill permeates the turkey. It’s not a strong smoke like American BBQ. More like something from a wood fired oven. BBQ turkey is too often overlooked. It’s a great way to mix things up. And it doesn’t have to be for special occasions. I don’t know where the rule that you can only make turkey at Thanksgiving came from. But I’m not buying into it. Barbecuing a whole turkey is not hard. And it’s damn delicious. It’s hard to cook a 30 pound turkey. It is actually near impossible to nail it. All sorts of tricks. Cover the breast. Baste. Put a damp sock on it. OK. I made the last one up. But you get the picture. Here’s the secret. Start with a small bird. 10 to 12 pounds is perfect. Easier to move around. Way easier to cook evenly. And you don’t wind up with 20 pounds of leftovers. Or enough turkey for 20 people. Which makes it perfect for smaller gatherings. I’ve been known to make barbecued turkey for six people. Why not? It’s like a really big chicken at 10 pounds. I like smoke. Smoke from charcoal. I find it makes a real difference. You may or may not agree. But you can make a grill roasted turkey on any type of grill. If you have a kamodo, the ideal set up is to use your heat deflector (legs down for an egg) with a pizza stone. Use pieces of split firebricks or an extra set of big green egg feet to put an air gap between the two. For a kettle, set up an indirect fire by banking coals on both sides, leaving space in the middle. Place the roasting pan over the middle. You will need to add fuel along the way so plan for that. For a gas grill, set it up for indirect heat and use some wood chips to impart the smoke flavour. If you don’t use wood, you are basically making your grill an oven. No smoke, no grill roasted turkey. There’s no secret here either. You are roasting a turkey. Barbecued turkey is the same as any other turkey. You get drippings. Add stock. Make great gravy. The only thing to keep in mind is the gravy will pick up a bit of the smoke. But that’s perfect. It complements the turkey perfectly. In fact, add a bit of chopped chipotle in adobo for an extra bit of flavour. Chipotles are smoked jalapeños. See where this is going? Grill roasted turkey. Barbecued turkey. Doesn’t matter what you call it. Just make it. Soon. You won’t regret it for a second. 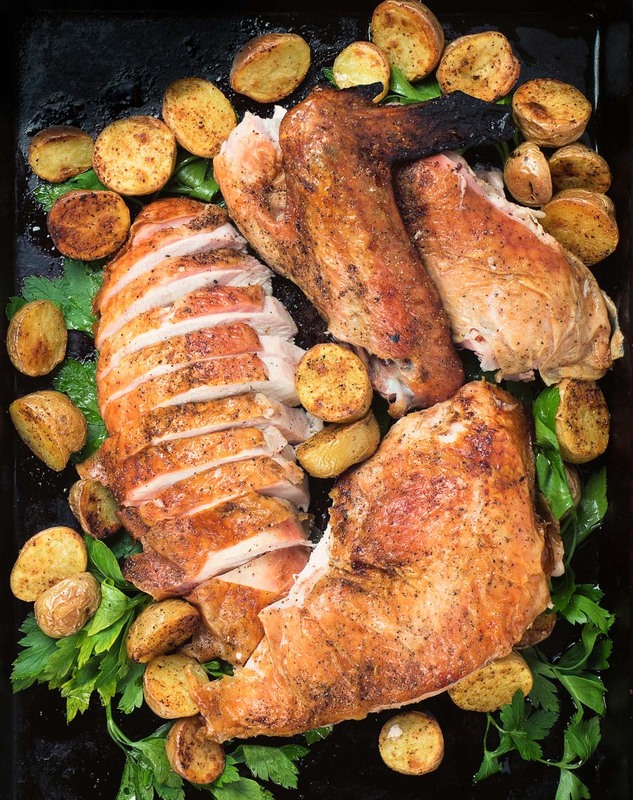 Grill roasted turkey takes and every day bird and kisses it with a bit of smoke for a completely different roast turkey experience. Remove giblets and sprinkle salt liberally over the turkey. You don't want to skimp on the salt in this step. Maybe cut back by 1/2 Tbsp if you are super worried. But don't skip this step. This is key to the best bird you can make. Double bag the turkey and place it on a cookie sheet. Refrigerate for up to 3 days, turning every 12 hours. Grill roasted turkey is all about the smoke. Charcoal smoke. This works best on a kamodo grill or kettle set up for indirect heat. Get your grill somewhere around 400F and stable. Pre-heat your roasting pan. A low sided roasting pan works best. A high sided pan will protect the thighs and make it difficult to get the thighs cooked fast enough so the breast doesn't dry out. 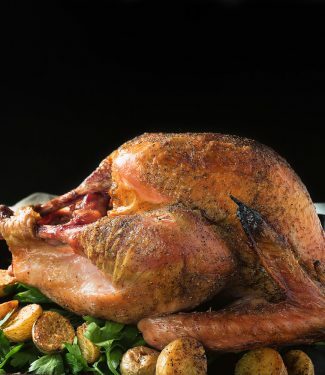 When it's hot, place the turkey, breast side up and roast for about 10 minutes per pound. Start checking internal temperature at about 7 minutes per pound. You are going for 160F in the breast and 170F in the thigh. The turkey will come up another 5 degrees as it rests. Remove the bird from the grill and let rest. Spoon off all but a couple Tbsp of fat, being careful to leave any of the coloured drippings in the pan. Place the roasting pan over medium heat and add the flour. Stir to combine the flour with the drippings and cook the resulting roux about one minute. Add about 1/2 cup of stock and stir to incorporate the flour with the roux. Don't add too much liquid at once or you will get lumps. Add the remaining stock and bring to a boil. If you get a few lumps, don't freak out. Just strain it quickly. Easy fix. Serve as you would any roast turkey. This recipe is about the smoke. If you are using a gas grill, you will need to try to add some chips to generate a bit of smoke. Just cooking it on a gas grill with no smoke is exactly the same as using your oven. Lump charcoal is best for this. Briquettes are a distant second. Gas grill with no wood chips is a non-starter. That sounds harsh but it's just a fact... No point to it at all. In american, bbq and grilling, main course, poultry. Bookmark the permalink.